Recent observations indicate that the Blight grows less rapidly at night. We will send our research convoy to our old home under the cover of darkness. We have modified several Scouts and Lynx tanks to temporarily resist the effects of The Blight. Unfortunately, we do not know how long we will be able to retain control of the vehicles before they become infected or what effect the Blight will have on the units. Watch them carefully and proceed as quickly as possible. Each Lynx is equipped with our new Laser weapon. These vehicles are very similar to those previously developed at our original colony site. Our units must infiltrate the colony and find the Advanced Labs where the information we need is located. Move a Scout directly next to the side of the lab so the Scout can scan the structure for the data. Scanning, locating, and transmitting the data back to us will take the Scout a few moments. This expedition is a one way trip. Once our units enter the infected area, they will be carriers of the Blight. We do not want them to return unless we are sure it will be safe. 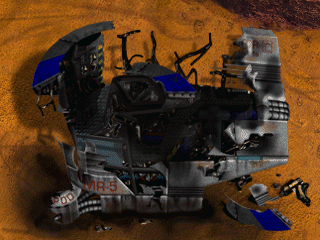 The Advanced Labs have sustained heavy damage and may explode spontaneously. If that happens the data will be lost forever. We must hurry. Check the Specific Objectives list for more information. Transmit data from Lab 1 at 46,34. Transmit data from Lab 2 at 26,25. Transmit data from Lab 3 at 20,55.